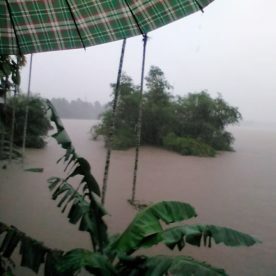 In August 2018, the state of Kerala, India, was submerged following devastating floods. With the highest levels of rainfall in almost a century, hundreds of people were killed, millions were forced to flee from their homes, and people remain missing. Buildings and cars have been washed away. Thousands of animals have drowned. Over 3,000 relief camps have been set up by the government and aid agencies. Naval divers and military rescue teams have airlifted survivors to safety. The cost of the damage to date is already estimated at over €2 billion across the state of Kerala. As the flood waters subside, fears arise over the potential outbreak of diseases such as cholera and typhoid. There is a danger that venomous snakes and insects may be left behind in homes as the flood waters recede. The Missionaries of the Sacred Heart are active in sharing the message of God’s love throughout the poorest communities in India, and have a novitiate house in Kanjoor, which suffered severe damage due to the flooding and its close proximity to the River Periyar. 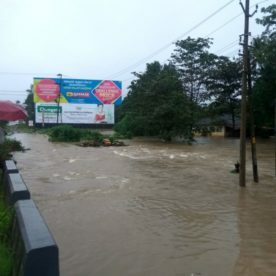 As our MSC brothers in India rally to help those who have been injured or displaced because of the ravages of the floods, we’re appealing to you to help if you can. The state of Kerala has been submerged by the worst flooding in almost a century. This includes families who suffered some water damage to their homes. These families have not incurred major financial losses, but need help in cleaning their homes and making them habitable once more. The highest number of houses damaged by the floods fall into this category. This includes families who have been forced to abandon their homes. Their houses were severely damaged, while the belongings they had no choice but to leave behind were destroyed by the flood waters. One example is Mr Virghees, who buys nutmeg grown in the grounds of the MSC seminary and sells it, along with other spices, to make a living. When the flood waters rose, he was forced to flee from his home, with no time to move his belongings to safety. He returned to find everything but the shell of his home destroyed by the water, including the spices that were his livelihood. There are many more similar situations in the local village, where people’s lives were swept away by the rains. This includes families whose homes were completely ruined by the floods. There are a variety of reasons that these homes were so irretrievably damaged, including poor construction, the age of the house, or its location in relation to areas prone to flooding. 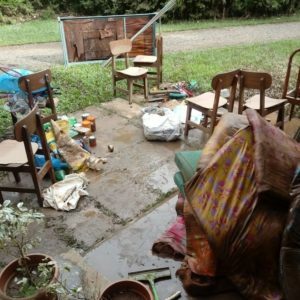 These families have lost everything, from their belongings and their houses themselves, and have been left destitute. 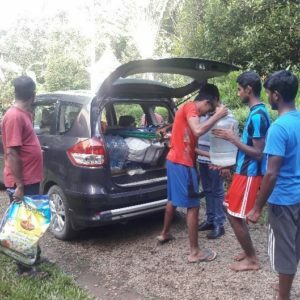 MSCs in Kerala have already been visiting families in need and providing emergency assistance. With Sacred Heart Seminary in Kanjoor acting as a relief base, our MSCs are reaching out to help families who are in need of urgent aid. However, as the Sacred Heart Seminary itself has been badly damaged by the flood waters, our MSCs cannot do it alone. It is crucial that they receive emergency aid as soon as possible in order to be able to extend help and hope to families whose homes and livelihoods have been destroyed in one fell swoop. in a letter from Indian Union Secretary Fr Syam Kumar MSC.